Though hung on a rack, Door Knob Hanger (or just Door Hanger) is the most descriptive name I can give this Nike Door Knob Hanger Branding solution. 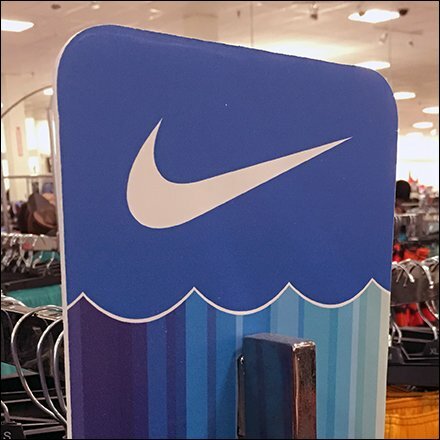 Place on any rail or rack and the Nike Swoop stakes out the brand territory for category management as well as identification purposes. And with Nike on the rack it communicates athleisure without saying a word. Colors and design might imply swimwear through seen in mixed merchandise. For Door Hanger posts by Title see..